Appealing and aesthetically built Amish chairs are great furniture items that can take you to the gentle eras of leisure, relaxation and comfort. Whether you want to have complete comfort at your dining area or you want to relax in your outdoor space, there are spectacular options of Amish chairs for serving every kind of space. From large size to small size, round shape to square cut, there are numerous types of chairs to consider when shopping for Amish furniture. These chairs are built with high precision by expert craftsmen so as to provide you with unparalleled solutions for your home. Whether you are searching for Amish outdoor furniture or want a sophisticated piece from a collection of indoor furniture, Amish chairs are must have items. These unique chairs are not only great in appearance, but also offer the quality to last a lifetime. When you sit on them, their high comfort level provides a truly amazing treat to the body! They offer the perfect blend of comfort and durability. All of these chairs are individually crafted with the customer in mind. These chairs are styled in such a way to give full support to your back and relieve muscle and body stress. With specifically contoured and designed slats, these chairs have the ability to take the natural curve position of the person sitting on it. A wide range of Amish chairs can be considered when shopping. From dining chairs to desk chairs and bar stools, you can buy all of them in order to enhance your space’s beauty. There are specially designed outdoor Amish chairs as well which can withstand harsh weather while adding complete comfort while relaxing in your outdoor area. Besides comfort, the warm look offered by these furniture items will make your outdoor space beautiful for having company over. In fact, Amish outdoor chairs are the best option to decorate your exterior space in a permanent fashion. These beautiful creations come in different styles and finishes which can be selected by you as according to your own need. For instance, you can have an attached foot rest or retractable foot rest. 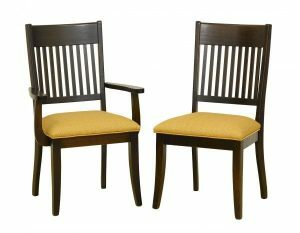 Moreover, you can also have matching stools and small sitting furniture items with these handcrafted chairs. These chairs are manufactured by Amish families in Ohio in many varieties of wood such as cedar, oak, white oak and many more. Chairs can be selected by you according to your preferred wood, finish and style. Such comforting, excellently built, heirloom quality Amish chairs can be purchased only from one store – Amish Originals Furniture. Our upscale store located in Columbus, Ohio can provide you with tailor-made chairs according to your preference. Visit www.amishoriginals.com to browse our showroom. You can also sign up for our newsletter to learn what’s new and get a sneak peak at Amish furniture items available to you.